Over the weekend, the Alaska Historical Society (AHS) recognized the Lost Alaskans project with their Pathfinder Award. We didn't know we were being considered so this was a wonderful surprise for a chilly Monday morning. The annual AHS meeting was held in Valdez. Here's information on the award from the society's website. The Pathfinder Award is given to an individual or several individuals who have indexed or prepared guides to Alaska historical material that has not been accessible. 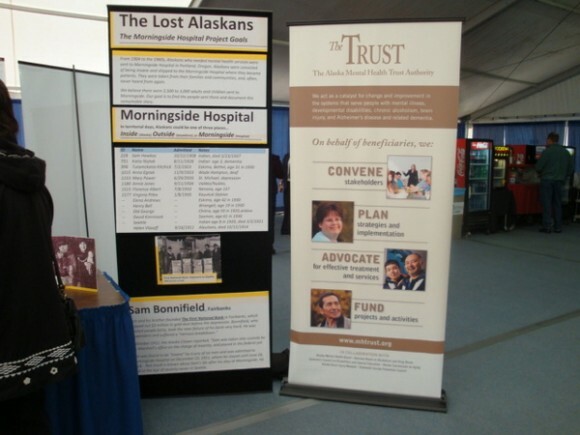 The 2011 Pathfinder award goes to the Lost Alaskans: Morningside Hospital History Project, and its primary researchers Ellen Ganley, Meg Greene, Karen Perdue, Robin Renfroe, Niejse Steinkruger, Sally Mead, Deborah Smith, Marylou Elton, and Vivian Hamilton. This group has worked to uncover the documentary record of mental health care during the years in which Alaskans were institutionalized out of state at Morningside Hospital. Their work not only helps reveal the past, but has had an impact on the lives of living family members seeking to understand what happened to their relatives. Wow, what a great start to the week! The Alaska Mental Health Trust Authority granted us funding to support research and travel. The grant is being administered by Access Alaska. Work on the patient database has begun. 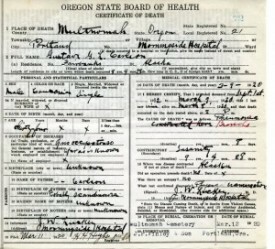 Progress was made in identifying Morningside Hospital patient burial sites (cemeteries), including locating a few patient graves. New territorial court records were located, providing insights into the commitment process. The documents included commitment orders, jury records and medical assessments. Research continued at the National Archives II. Most of the documents referring to individual patients are now scanned. Current research is focused on hospital inspections and investigations. Two great days at the Elders and Youth Conference. We had a booth (thanks to the Alaska Mental Health Trust Authority) and did a presentation yesterday afternoon. Forty (40) elders and youth were in the audience. We focused the presentation on telling the stories of some of the people who were sent to Morningside. A number of adults had heard of Morningside, and some had family members who were sent there. The best part was telling the story to young people, none of whom had heard of Morningside Hospital, but they all understood the tragedy of being sent so far from home. The Alaska Mental Health Trust Authority recently approved a grant of nearly $60,000 to support our research. Because we are all volunteers and not a part of any organization, Access Alaska graciously agreed to manage the funds. This grant will support the development of the patient database, archival support, and research related travel. Thanks to all who made this possible, and especially Doug Toelle, our Access Alaska project manager and friend.